A restored example of a lightweight Hewitt microphone boom with a 13ft arm. Film, tv and recording studio use. This big silver 'rock & roll' microphone type is seen often in promos and '1950s' recreations, usually featuring an overchromed reproduction. GA-TV has an original Shure 55S microphone, in brushed aluminium (better for the tv lights). Our well-worked example was used during the 1950s & 1960s by ABC Television in Hollywood for musical 'spectaculars'. A Turner 99 dynamic mic. Classic mic design from the 1930s based on the Western Electric 618. Ideal for reproducing scenes of American radio broadcasting or newsreels spaning the 1930s/1950s. Various mic 'flags' of the period, available. This small silver ribbon mic can be used on tables or floor stands. Popular use in the 1960s on tv pop shows etc. Several in working condition. Dynamic pressure gradient microphone designed for use with newsgathering tape machines such as the Uher Report 4000. Small (6cms x 2cms) moving coil neck-worn mic, engineered to reproduce speech from an angle. Can also be hand held or desk mounted. Items are in working condition. Used in studios and on location from the mid-1950s. XLR plug. 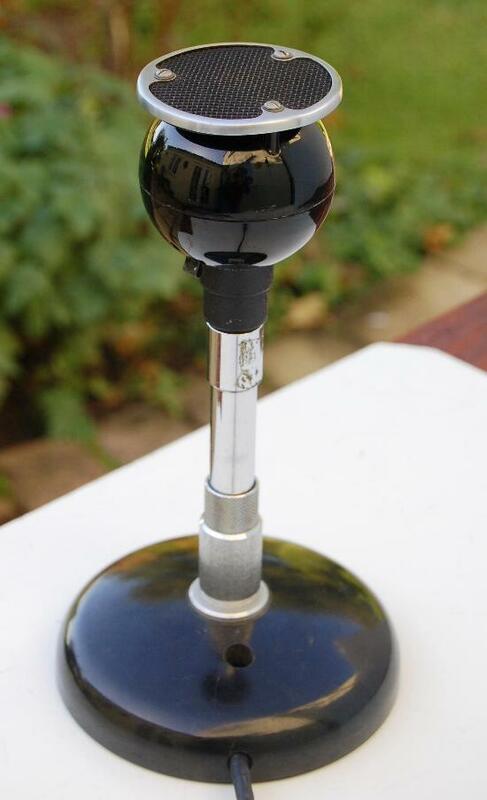 A dynamic microphone made by Dunstable-based KAM (Lamba PLC) 80Hz/10kHz. Heavy and rather dated in cosmetic design. However, ideal for 1990s DJs. Dynamic (moving coil) cardioid microphone. 60-16,000Hz. Typical shape of the period. 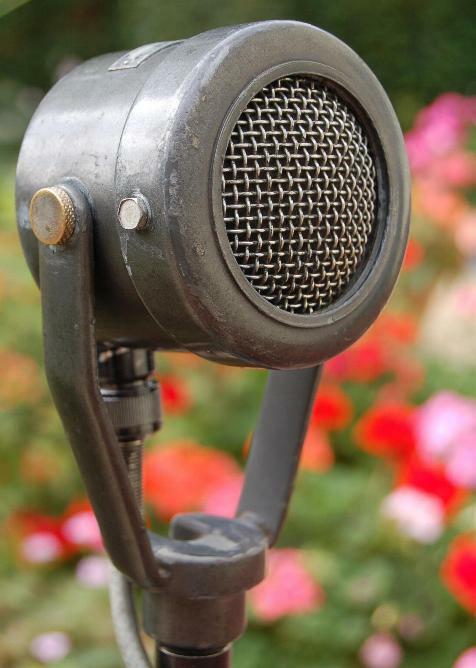 The Mole-Richardson Type 103B microphone boom was a familar item in both tv and movie studios from the 1940s onwards. The boom arm extends to approx 17ft and the base 'pram' has wheels, steerable from the rear. A certain skill was required to manipulate this equipment, not least to avoid hitting the talent or falling off. Our example, (pictured on a recent period production), is in full working condition and can be manipulated as desired. Small dynamic microphone. Suitable for 'roving reporter' scenes. This example used by BBC radio. A compact dynamic microphone from the Austrian company AKG, used in the 60's onwards for speech or vocals. The slots down the side provided an out of phase signal to the capsule giving a cardioid response. GA-TV has two matching examples, one in working condition. Grampian Reproducers Ltd of Feltham Middx produced the DP4/H, a hand held moving coil microphone with a response of 50-15,000 c/s. 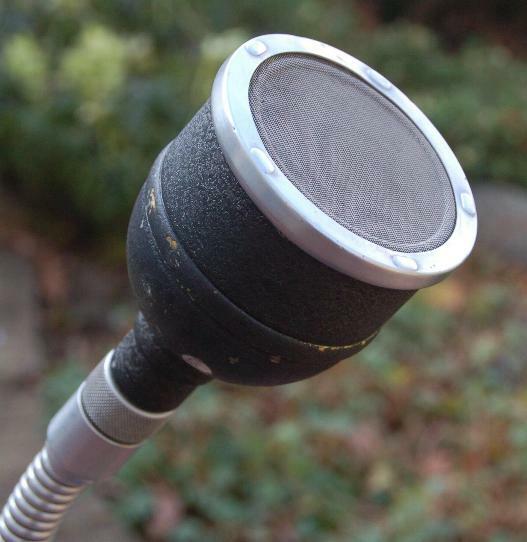 This familar and widely used steel-clad radio and tv interview hand mic was referred to as 'The Buchanan Hammer' presumably for its rugged durability. A dynamic mic with an omni-polar pattern and good flat speech reproduction without the need of a wind baffle, our example is in full working condition, if a little 'fish shopped'(chipped & battered). Three different microphones of unknown manufacture, displayed here for their shape and style. 1970s 1980s. Large silver microphone from the Turner company of Cedar Rapids Iowa. 1950s 'retro' style. Larger image shows floor standing rig. A dynamic microphone made by Electrovoice for the Auricon range of 16mm cameras. Good quality. 1960s vintage Lustraphone moving coil desk mic on a gooseneck. Suitable for 'talkback' scenes in the gallery or general PA.
Vitavox version of the STC 4017C moving coil microphone. Our example with repro 'BBC' flag, was used by the Corporation until the early 1950s. Looks the part in a radio studio of the period. Larger image shows the rear aspect which would be the usual operating position view. The Aiwa M18 is a 1950s crystal microphone intended for home use. However, the microphone is a 2/3rds 'lookalike' for the much more expensive and iconic RCA 77-B studio 'Pill' ribbon mic (introduced in 1937) which usually sells for more money than we care to contemplate. The Aiwa M18 can be used on a table or floor stand. The pair of 'Pills' pictured are the Aiwa M18 & the Crown MC-70, each very similar. Nice 1940s/1950s recreation. Large 1950s style bronze moving coil mic from EMI. Industrial or PA application. Looks good on a mic boom as pictured. 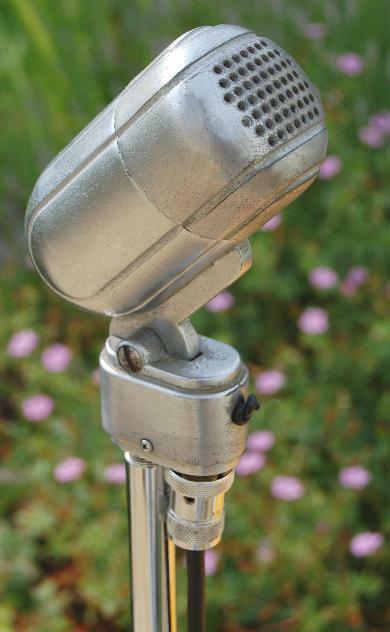 A reproduction microphone in the classic style of the Shure 55S. The Eagle G148 is a 'super cardioid' dynamic microphone with a frequency response of 50/1500 Hz. 3-pin XLR lead. Brand new and in fully working condition. Lavalier mics worn around the neck. These two Sennheiser mics, helpfully marked with the postcode and name of the orginal owner (TVS Maidstone Vintners Park Studios) are in working order. Designed to pick up speech from the direction of the chin upwards. 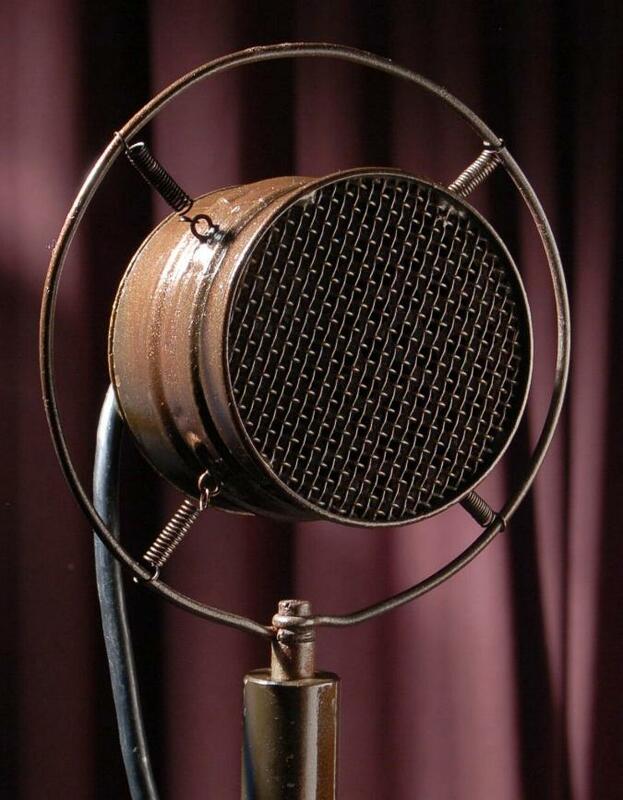 Reproduction microphone in the style of an Electrovoice 'Cardax' cardioid microphone of the 1940s/1950s. 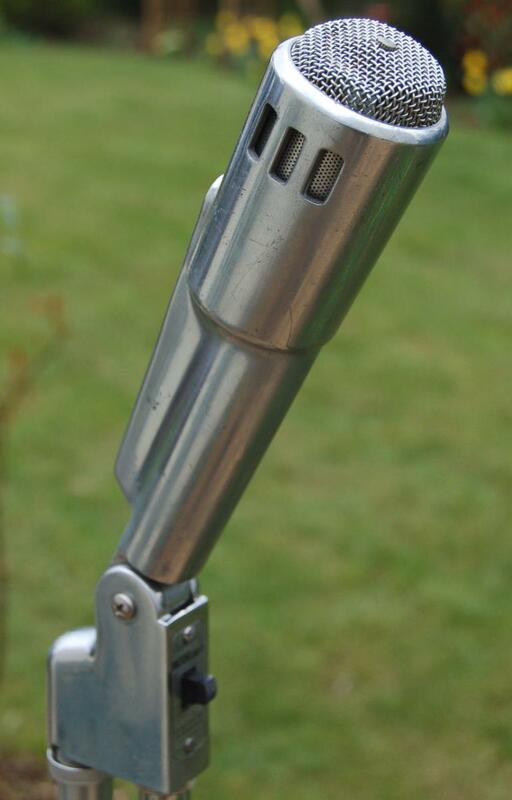 This YOGA is a good quality dynamic microphone in muted silver die cast zinc housing. FR 60Hz-16,000Hz. Sensitivity -78dB. Three-pin XLR. A rare Marconi-BBC Type 'B' ribbon microphone, developed in 1937 for use mainly on obs. This microphone, weighing in at 1.7kgs could be floor-mounted, desk mounted or suspended. 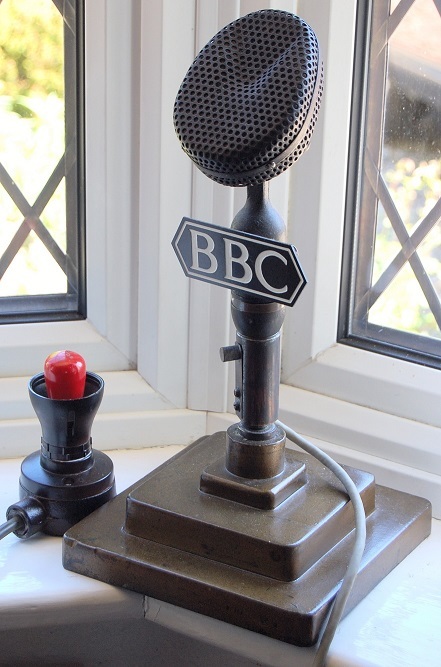 BBC photos of the period show the microphone in widespread WWII use (eg: Gracie Fields, ITMA,'Workers Playtime'). 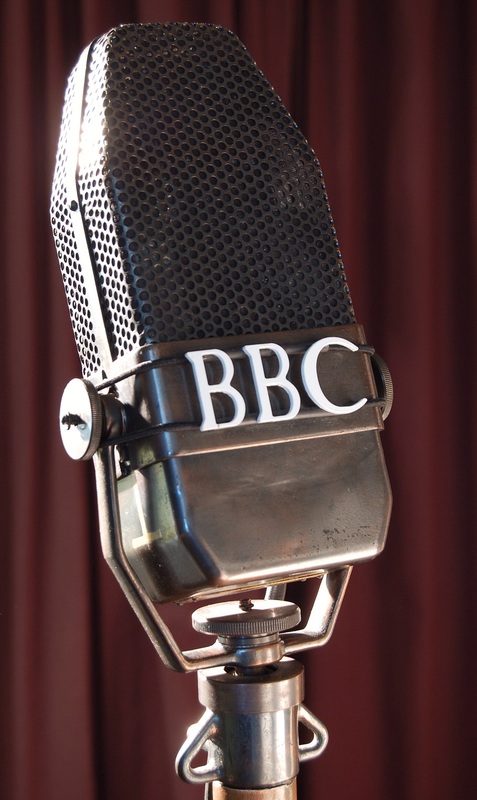 Large and imposing, the mic pictured (dressed with a BBC logo and on a reproduction stand)is in working condition. This actual Marconi mic was used by The International Broadcasting Company in their London, 35 Portland Place studios for Radio Normandy, a famous pre-war 'commercial pirate' radio broadcaster. (Technical note). Over 4" inches in diameter, this ribbon mic was made possible by the use of Alnico alloy (aluminium-nickel-cobalt) for the magnet, which allowed a small circular magnet to be used rather than the large horseshoe-shaped magnet of the Type A mic. 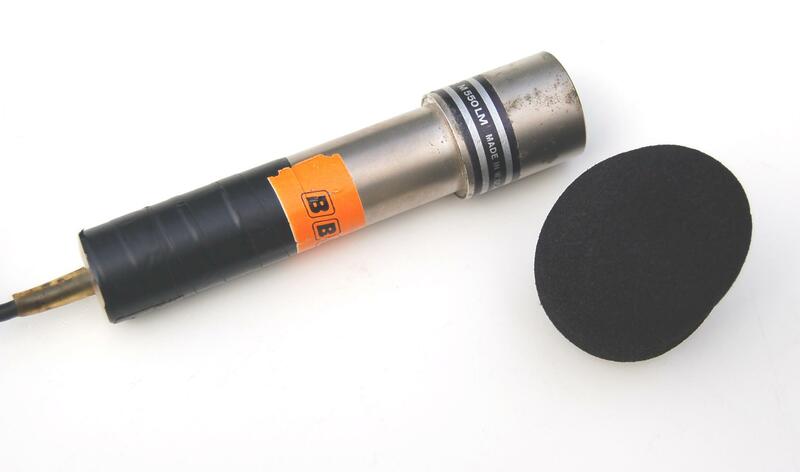 The type 'B' mic became popular for OBs and sports commentaries. It could be fitted to a breastplate, worn by the commentator. This ensured that the mic was always facing him as he turned to follow the action. This system was not totally successful and ultimately it led to the development of the L1 lip mic in the same year. (Chris Owen- Senior BBC engineer) Hire of this mic and stand would be under strict conditions. Modest 'footprint' microphone boom. Suitable for small studio spaces. This is the 'classic shape' iconic BBC ribbon microphone of the 1930s/50s. Chris Owen, senior BBC sound engineer elaborates: 'In May 1931 RCA demonstrated their ribbon mic in Hollywood and it came to the BBC's notice. Unfortunately the price, including the head amplifier, was 130UKP which in today's terms is around 5200UKP. As this was not affordable, the BBC set about designing its own version, which was introduced in 1934-1935 as the Type A microphone. There was some concern about the possibility of patent infringement but eventually it was decided that the BBC had a valid patent. The mic was manufactured for the BBC by Marconi for 9UKP each, about 360UKP today. The original aluminium ribbon had objectionable resonances and was replaced with very thin aluminium foil and the modified mic was called Type AX. Another problem was found when the mic was used near an electromagnetic field; this was solved by arranging the internal wiring of the mic so that induced noise currents cancelled out and thus the Type AXB was born in 1943. The final modification was to use Ticonal magnets in place of the original cobalt steel magnets. This gave 6dB increased sensitivity and the letter T was added to the code number. Weighing in at just under 9 lbs, the type AXBT appeared circa 1944. The microphone pictured is an exact reproduction. Long version of the STC 4037 type 'Stick' dynamic microphone. Working condition. Used on radio and television. Hand-held or stand-mounted option. Sturdy microphone of the 1950s, the STC 4035 was used by the BBC at various locations as a speech, interview or effects mic. Also available with a single or double goose neck table stand suitable for 'conferences' or 'speeches'. The BBC L.2. 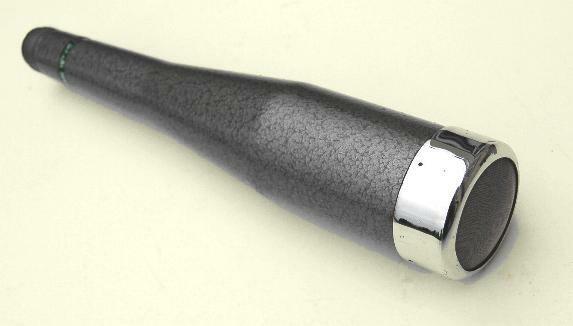 LIP MIC, designed originally in 1937, was used (and still is) for sports commentaries and venues with a noisy ambience. For the best results, it is necessary to speak very closely into the microphone. For this purpose, a metal guard at the front of the microphone gives a precise speaking distance of 2 1/2 inches when pressed against the top lip. The design was improved further in 1951 and production models were used extensively by commentators at the 1953 Coronation broadcast. Our example pictured, is ex-BBC OBs circa 1950/60s. 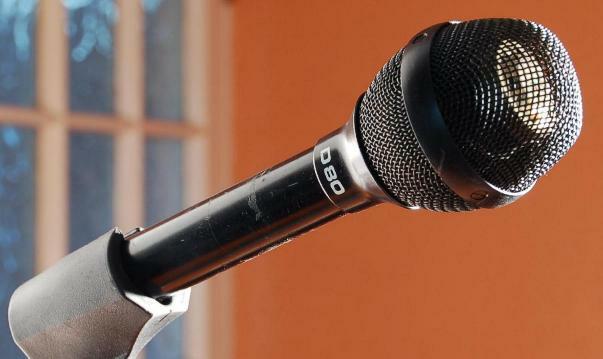 D109A, a slender and very small silver AKG dynamic microphone. BBC usage. 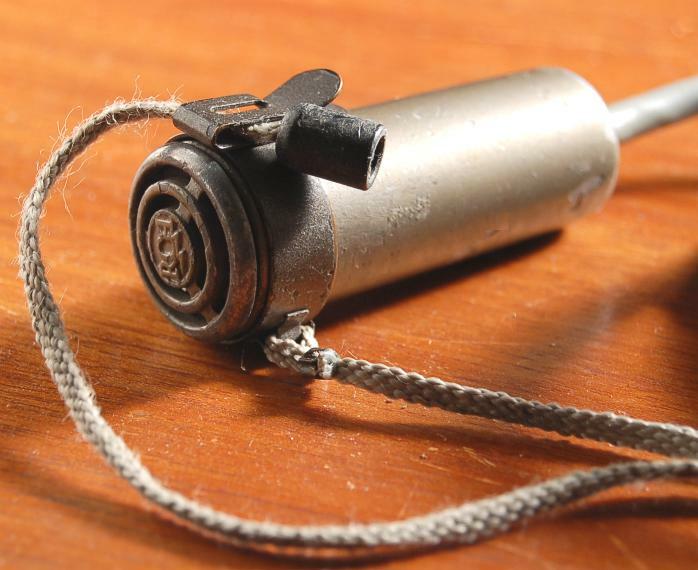 An original microphone from the 1930s with it's unique lever-operated (but clumsy) cable connector. The Western Electric No. 618A is an important historical mic. It was the world’s first dynamic (moving coil) mic (developed by Bell Labs) and introduced in 1931. 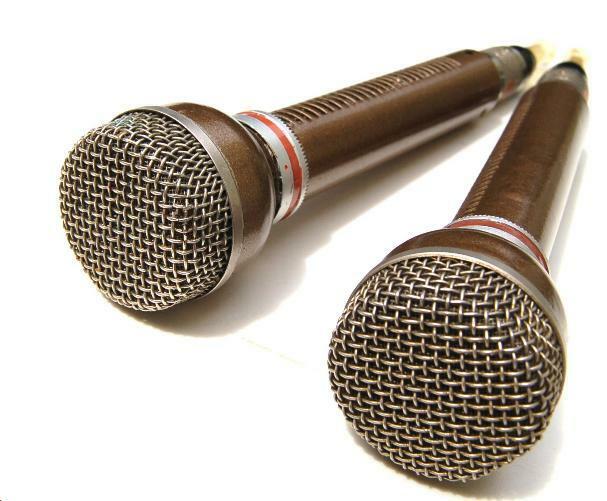 It quickly became a favorite of US broadcasters as an all-purpose studio mic. 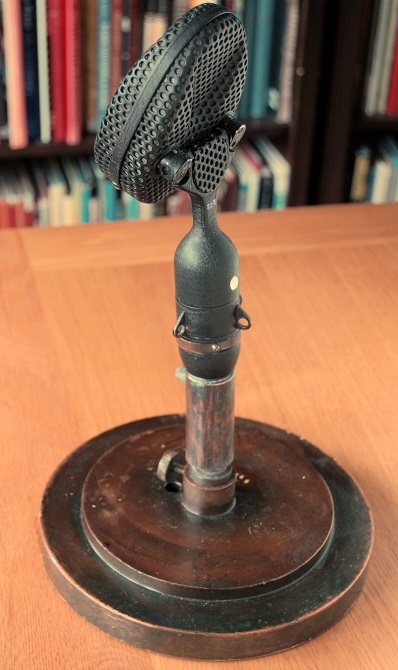 It was used also as a 1930s newsreel mic and notably by Franklyn D. Roosevelt for his US radio ‘fireside chats’. 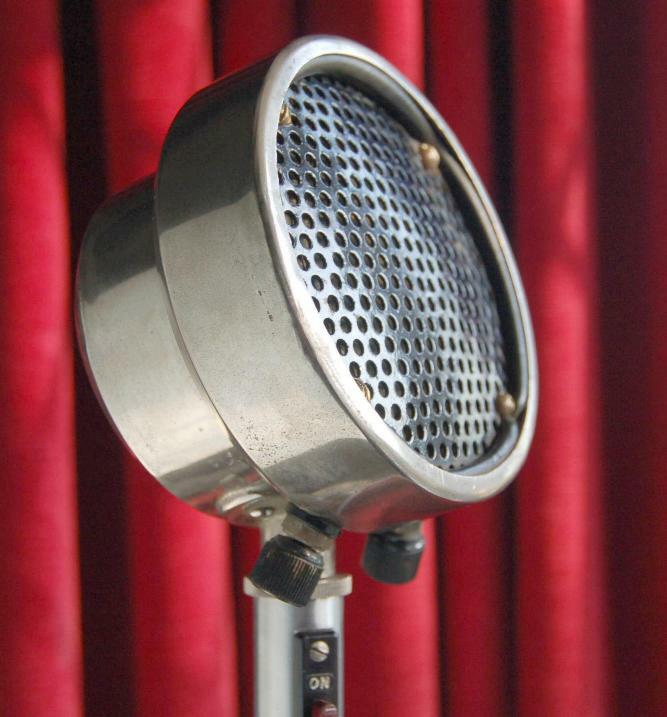 Quality dynamic French microphone which appeared first in 1948. Used mainly by broadcasters and film production in Europe. Rycote mic wind shields. Several sizes to wave about at press conferences. Larger image shows the mic with a pole and AGK headset combi. Two 'Daffodil' old style carbon granule microphones of unknown vintage. They would be suitable for recreating the 1920s in radio studios or public address of that era. Desirable iconic ribbon microphone from STC. This microphone is'fig' shaped and compact. Senior BBC sound engineer Chris Owen adds: The 4038 has internal hum neutralizing wiring coupled with magnetic shielding of the toroidal ribbon-to-microphone line transformer reducing response to stray magnetic fields by 30 to 40 dB. For many years, the 4038 was found in virtually all BBC studios. Indeed, many studios were equipped with no other type of mic. 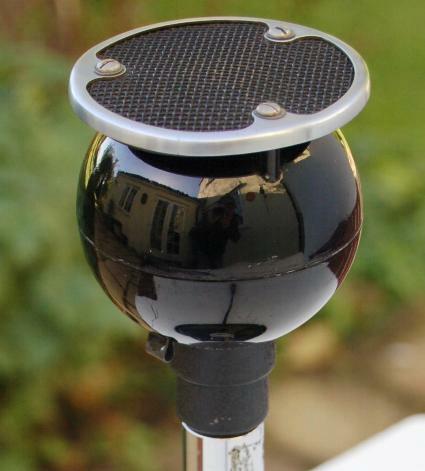 L1 lip microphone, manufactured by Marconi's Wireless Telegraph Company Limited for the BBC.A development of the Marconi ‘B Type’ microphone, the ‘L1’ microphones was designed for use at large events, such as during sports outside broadcasts, where the voice of the user needed to carry over crowd sounds and other background noise. The L1 was designed in 1937. A guard ring that the commentator held to their face ensured that the microphone sat at a consistent 2.25 inches from the user's mouth. Lightweight portable radio/tv studio/location microphone boom with counterweight balance. Approx 7ft height and reach. Wheels additional if required. Ideal for theatre or restricted space use.